The Summit is a special place for friends and families to have fun bowling and playing laser tag and other games while enjoying delicious food and drink in a welcoming environment. 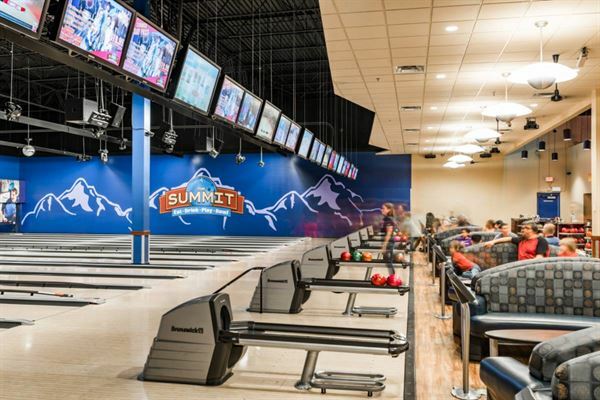 The Summit strives to provide hometown service, lots of smiles, and a genuine experience whether you’re bowling, playing games, or spending time with friends or family that we hope will provide our guests with lasting memories. The Summit offers the perfect venue for parties or group events. The number of ways to have an event or celebration at The Summit is practically unlimited! Options range from a small gathering lane-side to a party or event in one of our meeting rooms, to reserving the complete Crossroads Tavern and Grille or even reserving the entire Summit for receptions or corporate events. Food and drink selection was excellent. They cater to groups of all ages, but our group was all adults.Lots to do: bowling, video games, pool, lazer tag. Lots of flat screens to watch sporting events, while you bowl or in the restaurant and bar.We are considering coming back for our holiday party !